It’s treat when I see an owl. Most of them are strictly nocturnal and they fly on silent wings. People hear them call rather than see them. 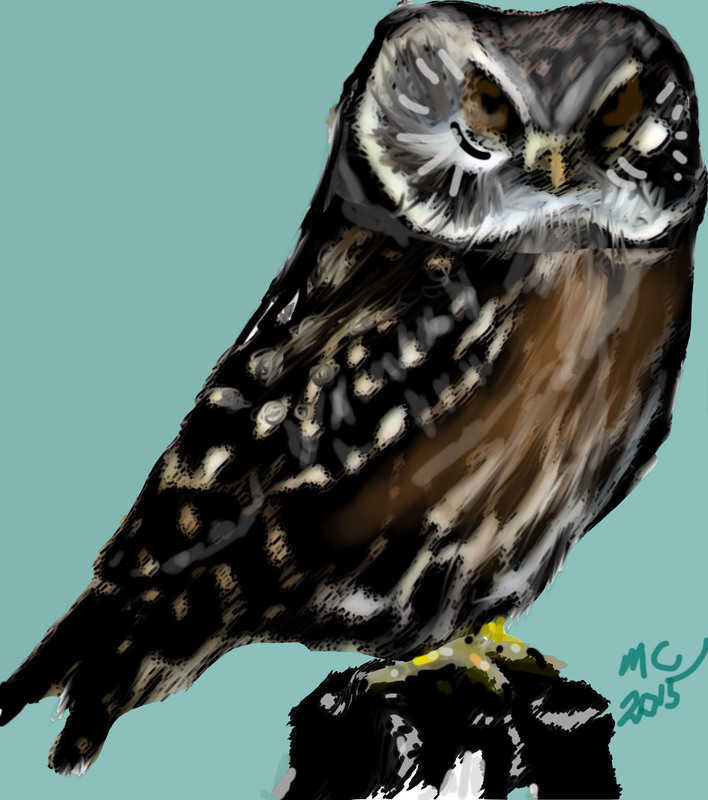 Owls also populate literature and mythology — witness Hogwarts and Harry Potter’s messenger owl. The ancient Greeks, among others, thought they were wise, partly because they had big eyes and stared knowingly. In fact, owls are, by all reports, rather dimwitted. Their eyes take up so much room in their skulls that there’s little room left for brain. The zoo also took in injured animals, many of which were too far gone to save, which is where the owl comes into this story. Someone brought in a Saw Whet Owl for treatment. Saw Whets are small, relatively tame owls that sometimes take up residence in garden sheds. The poor bird had flown across a road and collided with the side of the car. The good souls in the car hoped we could save it. Now, it was pretty obvious when we saw the bird that wasn’t going to happen but we said we would do our best. The rescuers had the owl in a cardboard box and had wrapped it in a blue baby blanket with only its head showing. I believe the blanket had singing birds on it, which shows how sentimental people can be. I took box and bird to the aptly named Bird House where I set up a heat lamp. I also prepared some high-energy food. I would need to try to feed the owl if and when it revived enough to eat. In the meantime, I had hungry birds to feed, including parrots (who treat complaining as a sport) so I had to leave. Anyway, I was also sure the Saw Whet wouldn’t last the hour. When I returned, the little owl was indeed dead, or so it seemed. I sighed, reached into the box and picked up the little limp body ready to dispose of it. At my touch, the yellow eyes snapped open and the head leaned forward. The owl yawned and inhaled the tip of my little finger. T.H. White, the author of ‘The Once and Future King’ also wrote a book about raising a Goshawk. He says about that bird that “the beak was not formidable, but in the talons there was death”. The same must be true of owls. The little beggar I was holding tore a groove in my pinkie and then flipped around, contorted, and nailed my thumb with its talons. Now, I had heard that an owl’s fore and aft talons ‘locked’ on prey and couldn’t easily be released. I can attest to the truth of that assertion. I could not get that flippin’ owl to release my thumb and it bleeding hurt. The talons had found good, responsive nerves and the more I tried to ease the pressure, the deeper in went those rapier points. I’m making a very long story out of it. I’d like to say that the owl survived and went back to the wild but, alas, it died soon after its last heroic effort. Some time later, with difficulty, I finally got my thumb out of that formidable grasp. I bandaged up finger and thumb, grabbed a quick meal. I still had to take Susie out for her evening walk. A pair of Great Horned Owls nested high in a Doug Fir. The owlets are now in the ‘brancher’ phase and make quite hilarious little murderers as they move out of the nest and explore. Yesterday, the little guys were sleeping but today they were more active. As I watched, the mom (or dad?) came in on silent wings and visited with the owlets. I didn’t see any feeding but the adult talked to the chicks in low hoots. Every once in a while, one or the other stared down in my direction but, as i was at was at least a hundred yards away, I doubt if they were thinking much of me. Lots of cyclists, dog-walkers and joggers also use the same path. The ‘nest’ itself is pretty shabby — no good housekeeping awards here. Birding Basics: What to Wear, What to Take. Would James Bond wear that hat? I think that one of the reasons I’d strayed from serious birding long ago was that I thought I’d have to dress in the Boy Scout inspired costume worn by Nancy Culp and Wally Cox on the Beverly Hillbillies — birdwatcher garb as imagined by Hollywood, which dates me, maybe even carbon dates me. When I was young, I wanted to emulate James Bond — I wasn’t alone in that. I imagined myself playing for high stakes in Monte Carlo and driving a fast car — and the rest. I was pretty sure that James Bond would not wear a Wally Cox birding outfit, even as a disguise. I glossed over the fact that the original James Bond, whose name Ian Fleming used for the super-spy was, in fact, an ornithologist. But I refused to wear sensible clothes and sensible shoes. My feet paid the price. Happily, I never stopped looking at birds and I even was bird keeper in a small zoo for a while. Now I know better. Stand out in a marsh in the pouring rain without proper gear and you’ll soon be wishing you had on a pair of those unbecoming rain pants. Hiking through chaparral in the hot sun without one of those floppy sun hats will convince you that you need one in a hurry. I like fly-fishing shirts. They’re lightweight, vented and they’ve got lots of pockets. Simms shirts have a nice little fish logo on them too for what it’s worth. I’ve got some cargo pants with the detachable legs but I rarely wear them. I don’t like the material and I don’t really like the way they fit. I do have a pair of cotton cargo pants with nice leg pockets but these may soon wear out, which is too bad because I love them. What I take with me on a birding trip depends on how I plan to travel. If I’m going by car, I load up because, well, why not? I’ve typically got about five times as much stuff with me as I need. I take too much when I fly too but less of it. I usually pack three shirts, four or five tee shirts, an extra pair of pants, four or five underwear, a pair of light shorts, four or five pairs of socks, and the usual toiletries. I always have a small flashlight with me and, if I’m going by car, a good folding knife. I take guidebooks if I’m on a road trip but rely on e-versions of Sibley and other publications more often than not. I rarely take a guidebook on a trip that involves air travel. Even with my 20” roller suitcase and my pack, I have only so much room. Since I might have to cook something or make coffee out in the wilderness, I carry a compact, lightweight kettle/saucepan too. It has a couple of cups nested in it. That plus my combo fork and spoon and my folding knife gives me the opportunity to make a meal when necessary. Often motels I stay at don’t provide breakfast, or coffee (or even shampoo, for that matter). If they do, often nothing happens until long after I’ve headed out looking for birds. Having the means to make an early morning cuppa and a bowl of instant porridge is important. Birders almost never forget binoculars and camera — at least I don’t think so. Forgetting binos would be a disaster unless, of course, the opportunity to buy something newer and better turned up. Naw — that’d never happen. For me, an IPad is essential — how did we do this before we had these devices? The IPad is also my travelling library. Because I tend to use the camera more than a scope, I often don’t take the scope when I go hiking. I have it and tripod in the trunk of the car for those times when I do feel the need. I’m always delighted with what I see when I do use it. I check eBird daily for rare birds, to learn about hotspots in an area, and for a half dozen other reasons. I also try to find out the local rare bird reports. Washington Tweeters has been very helpful in this regard. I’m a writer so sometimes I work on the IPad but I have an older netbook that works better for that purpose. I carry the usual battery chargers plus a spare camera battery, protein bars, cookies, pens, notepads, maps, bird books, spare reading glasses, an extra cap, a raincoat and pants, and extra shoes. And then there’s my travelling mini-pharmacy also. I hate waking up in strange hotel room in a tiny town with a headache thinking about how much I wished I’d packed some aspirin. I’ve got two phones — my home phone that I don’t allow to ‘roam’ and an inexpensive pay-as-you go Quad phone. I buy a SIM for the phone if I’m in another country. I’ve used mine in Italy, France, and Mexico and it does the job very well. I paid about twenty-five dollars for it. I’ve probably forgotten something, which usually happens anyway. Still, a person can go a long way with a credit card and necessary travel documents. Sensible people make lists, I guess. Maybe James Bond does. I might make a list of something other than target bird species sometime. 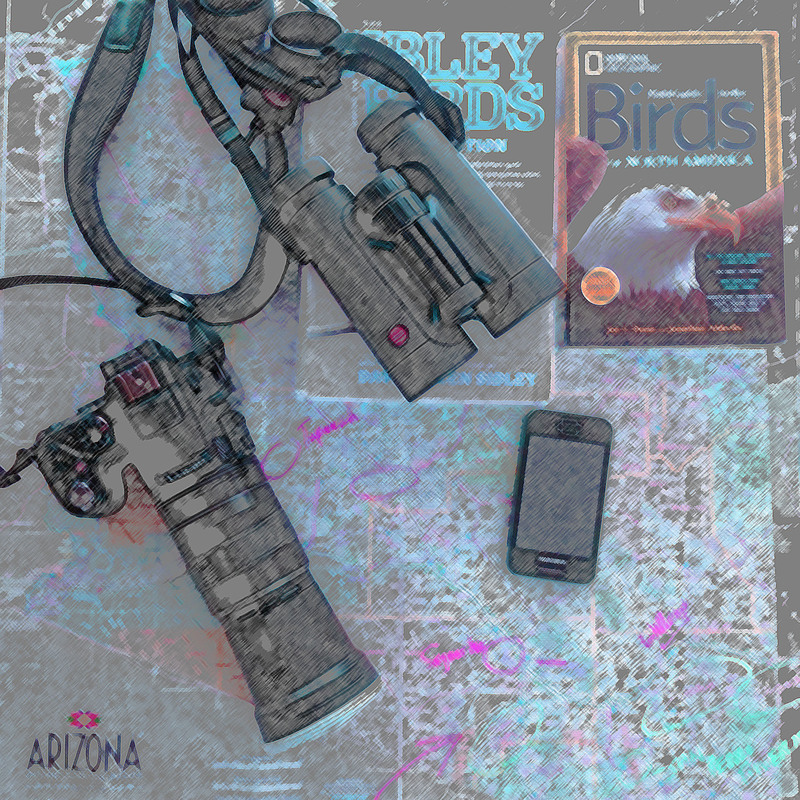 Author cran621Posted on April 7, 2015 April 14, 2015 Categories UncategorizedTags Arizona birds, Big-Year, bird lists, birding, birdsLeave a comment on Birding Basics: What to Wear, What to Take. I like gear and I’ve got fly rods and reels, chef’s knives, rock hammers, etc. to prove it. The need to acquire birding gear did not put me off birding, but rather that contrary. A good pair of binoculars is, of course, a necessity. I have a pair of older Pentax 8x32s. There’s absolutely nothing wrong with these, (or ‘this’ — I guess it’s a binocular) but I decide I need a wider lens so I search for 8x42s. I pick the Leica Trinovid, the step below the premium model, the Ultravid. For a week or two, I consider 10×42’s but know they still won’t not take the place of a spotting scope. They have a smaller field of view too. Testers rank the Trinovid very high with some unable to see a real difference in what you see and how you see it between the two models. That’s good enough for me. There’s a thousand dollar difference between the two. I always try to get the best of whatever from upper mid-range, which is where I think the value is. The same goes for sound equipment or anything else that depends on one’s sense acuity to really appreciate the difference. Some maintain that you have to have the top model from the top maker, and it may be true generally. Not for me though. I’ve got rock and roll damaged ears and I’m myopic with astigmatism. Average good is the best I’m going to get out of even top level, hyper expensive stuff. It’s not the output, which I’m sure is superb; it’s the input, which is not. I’ve been happy with my choice, although I do look with longing, sometimes, at the premium Leicas, Swarovski and Zeiss binos that others carry. I like their fancy scopes too. I do that for the same reason I drool over Lamborghinis and Maseratis. They’re really, really, really nice (they sound great too). The thing is — I’m not going to get my money’s worth out of these jewels, even if I could afford one. I’d drive my beautiful Maserati at, or around, the speed limit and I’d fret about getting a scratch on it. After a few months of birding I can’t put off buying a spotting scope any longer. I’m missing too much. I go through the same pleasant ordeal — checking reviews, looking for bargains, imagining. I pass on the luxury glass and settle on an Alpine 20×80 and mount it on a used carbon-fiber tripod I picked up online for half the price of that item new. The whole kit sets me back six hundred dollars. It works fine and, while I’m careful with it, I don’t treat it like it’s made of porcelain either. Half the time I use my camera as a spotting scope. I bought a mirrorless Panasonic DMZ200 and put a lens converter and extender tube on it. Now I’m good for, oh, a long way off (I’ve never really mastered the technicalities of photography). Using the focus functions also challenges me mostly because I forget what I did in similar circumstances the last time. The thing is I’m not that interested in photography and its ephemera don’t dazzle me. But I am interested in birds and a camera makes everything easier. I shoot a lot of pictures and hope for the best. Sometimes I get very, very lucky. I’ve got the full version of Photoshop so I can bring out details that I might otherwise miss and I resist the temptation to put in others that aren’t there in the first place. A person could use Photoshop to create pretty well any rare bird they wanted. Getting it past ebird is another matter entirely. By the morning, I’ve changed my mind. I’ll go after the Wren another day. Someone mentioned the San Pedro River and the great birding to be had there plus I can hit another famed spot — Whitewater Draw — on the way back. I grab an egg bun at a fast food restaurant and a coffee, gas up and head towards the San Pedro house and the San Pedro National Conservation Area. It’s bit of a drive to San Pedro and after a hundred miles or so I’m thinking fondly about bacon and eggs. I find a breakfast place in Buena Vista, a pretty town that seems to have a fairly affluent population. Afterwards, I discover it’s not far north of the border check where officers stop cars looking for illegal immigrants. There are great gulfs in this world, of all sorts. In any case, that stop rewards me with a pair of Chihuahuan Ravens, a species I’d hoped to see on the trip, plus I got my breakfast. San Pedro House is yet another birding mecca. The old farmhouse is pleasantly situated in a grove of cottonwoods. Gila woodpeckers, various Sparrows, Lesser Goldfinches, and Inca Doves are working the feeders around it. In the cottonwoods, a Western Screech Owl occupies a nest box — its head stuffed through the opening, closed eyed and sleeping in the sun. From the high branches, a Merlin scans the area. It’s warming up nicely. The well-used trail leads through scrubby grass and sagebrush. Pyrrhuloxia seem to be everywhere, as do Lark Sparrows, which are abundant on these flats. The trail leads to a noisy brook — the San Pedro River. Apparently, this valley is on the routes illegal migrants take when they come up from Mexico but I see no evidence of this. A Rufous-crowned Sparrow is a highlight. I leave San Pedro early enough to be able to visit Whitewater Draw, another renowned south Arizona location. The sloughs here are filled with waterfowl and large flocks of Sandhill Cranes line their low, sloping banks. They are noisy critters, those Sandhills, and I’m glad I’m not tenting in the area — sleep would be well nigh impossible. A fieldtrip to the Sulphur Springs Valley is my last with the Festival. This one is about raptors and I’m excited about it. The valley is known for its raptors but, for miles, we see not a one. And then our luck changes. Near, on and about some stacks of hay bales in the middle of a field, the raptors have gathered. There are at least two big Ferruginous Hawks, standing on the ground, looking like eagles, perhaps a dozen soaring Redtails inhabit the quadrants of the sky Off to the left a Harris’s Hawk wings by, all black and russet; a Kestrel takes up post on a power line; and then, swooping close to the Ferruginous at lightning speed, a Prairie Falcon completes the picture. Surely, it’s the bales that draw them and the mice and rats that inhabit this rodent apartment building. It’s a thrill to see these raptors. We pile back into the school bus. Our leader is the same man from the day before. Then he was unlucky; today he is lucky; today makes up for all. At a farmhouse at a crossroads, we find a pair of nesting Great Horned Owls. I’m amazed, sometimes, at the behaviour of some birders. My philosophy with birds is to gaze for a polite measure of time, take my pictures, thank the bird for being there and then move off quickly and silently. I try never to crowd the birds, particularly owls. Resting is a life or death thing for them. Some people, however, seem to think that the birds are there for them t take pictures. They move up closer and closer, talking loudly, snapping shots with their phones. Maybe it’s okay but it bothers me to see such, for want of a better word, disrespect. We’re seeing lots of other birds too. I’ve lost count of Meadowlarks (both Eastern and Western occur here but I can’t tell them apart, not with my eyes). We’ve also seen Thrashers, Loggerhead Shrike, a Red-naped Sapsucker and a couple of Ladder-backed Woodpecker. A brace of Greater Roadrunners fill out the score. And that’s it for the Wings Over Willcox festival. When the bus returns to the Community Center, most everything is packed up. Even the Kettle Corn seller who accosted every passerby has departed the scene. I return to my motel room. I’m ready to move on. The Willcox Golf course is a prime birding area and very close to the town. On this score, an overzealous ebird volunteer corrected me on the distance I’d travelled. I’m getting used to ebird challenges so I rarely now record a species unless I’m damned certain I’m correct and have good pictures to prove it. Being corrected on distance is a new one for me but I guess it matters to some researcher somewhere. Part of the problem in this case was that I had to drive miles to find the stupid place, which is called the Cochise Lake and Twin Lakes Golf Course not, as I thought, the Willcox Golf Course. But I digress. Waterfowl and shorebirds frequent the sloughs near the course. A sandy road makes a circuit of the sloughs, which, I think, are called playas in these parts. Most stops along the route are productive. A dozen or so Long-billed Curlews feed in the shallows and, near them, two American Avocets. The Avocets are rare here at this time of year and I’m delighted to see them. In the middle distance, huge flocks of Sandhill Cranes arrive and depart in noisy confusion as the sun begins to set. A cold wind that could ‘trim a hedge’ makes standing around watching more a bit of a trial. A Vermilion Flycatcher drops by and poses for pictures. These little birds, black masked and tropical red, always delight me. I also spot a Say’s Phoebe and then a two Black Phoebes and, with that, I call it a day. That night I eat at the local Barbecue, which is okay but. Like many things in the town, the atmosphere is not overwhelmingly welcoming. With that, I’ve done the Willcox nightlife so far as I can tell. In any case, my eyes are strained and I’m bone tired. Enough, Michael, tomorrow you start early. I go back to the motel, get ready for bed and fall asleep before I get through two pages of my book. My first official field trip of the Festival is to the Cochise stronghold, which means I’m see more than just birds here. I love history, having written over a dozen history textbooks in my time. I also love the history of the old west. Cochise led the Chiricahua Apache against American soldiers and settlers in the in the 19th century. The war started over a cow and ended up costing four thousand lives. I know it would have been death for our little party to be in the pretty park on the stream back then. Today, the Chiricahua have a few ceremonial acres donated to them by a white benefactor. It almost makes one weep to think of the injustice of it all. This is the beginning of a long weekend, which means campers and RVs are in the park early to secure a spot for the weekend. The desire to be closet to the washroom results in some amusing attempts to back ten-foot wide vehicles into nine-foot wide spaces. I’m estimating, of course. I don’t need to measure vehicle or space. What I can say is that aluminum being scraped by tree branches makes for some God-awful screeches. This happens to different RVs in different spots at least a half dozen times. It makes birding less serene, that’s for sure. Some times a group leader doesn’t have the bird luck, not when you’re part of the group anyway. This has now happened to me. I’ve drawn the unlucky leader. The birds just aren’t there for us, with the result that members of the party drift off on their own, or tag along with a new group which seems to have drawn with a lucky leader. I did both. I got a sweetly singing Canyon Wren out of the latter bit of disloyalty. I picked up a few other birds, including a Townsend’s Solitaire, but it was the fact of being in the Stronghold with its echoes of the last days of an independent Chiricahua nation, that resonated the most with me. I’m almost sad to leave but the din caused by arriving RVs backing into too-small sites helps us on our way. We make a stop to check out a flock of birds that turn out to be lark Buntings. Then we move on to a dairy farm and veal ranch that has a permanent pond. Nothing much to note here — Northern Shovelers, Widgeon and Mallards predominate. I’ve seen all these guys many times before. And then we’re back at the community center and pile off the school bus that has transported us around. I don’t have a trip planned for the morrow so I’m free to explore on my own. Conversations on the bus have given me some options. Next morning, I’ll head south. I’ve heard there’s a Sinaloa Wren down there and I’d like to have that bird!